What Is a Smartphone to a Kid? What is a smartphone to a kid? 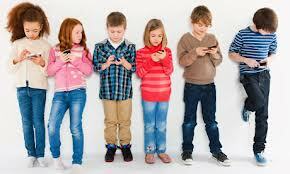 What is the first thought that comes to a kids mind when he thinks of a smartphone? What role does “location” play in his thinking process? How can it be used for education? Last Friday, June 14th, during the celebration of the new grant River City Youth Foundation (RCYF) received from the City of Austin’s government, I was struck by a 10 years-old Latino kid who gave me a genuine and spontaneous answer to the question: “Tell me three things you can do with a smartphone?” In Spanish, I had posed the question to the entire audience who were residents of DoveSprings, a low-income neighborhood in the southeast of Austin. Oné Musel-Gilley, the PR of RCYF and founder of the program Techcomunidad, was asking the kids educational questions and presenting them with awards. Many children were standing in front of me and could not wait to hear my question. Thus, the boy was pretty excited to answer the question in order to get the award. Moreover, he needed to be competitive; after all there were others kids standing besides him, all of them eager to earn a gift as well. After thinking for a few seconds, the kid said the answer at full blast: 1) Look for places, 2) Talk to friends, and 3) Take pictures. His response could not be more complete. He was happy as he was rewarded! There were three observations that I made about his response. First, his response conveys the potential of the smartphone as a tool to enhance people’s sense of physical places, the development of location-based applications, and the potential of place-based storytelling. Second, it shows the social aspects of the applications. It is interesting to note that he used the verb “to talk” instead of “to call”, extending the meaning of a smartphone to digital social networks. And third, the “take pictures” response also illustrates the smartphone as a practical tool. Another interpretation of his answer is the fact that smartphones are highly associated with navigation. I was wondering to which degree of familiarity the kid had with smartphones. I then noticed that his mother had a smartphone. In the beginning of the celebration, when just a few people were there, she was using it. After a while she put the phone down on the table. It is very likely that this kid’s family use the smartphone for navigation purposes. The kid’s response was overall representative of how kids in this day and age perceive digital mobile devices around them. For example, findings from a technology survey by CDW-G highlight the difference in how teachers and kids perceive technology. While 75% of teachers say they regularly use technology in their classrooms, only 40% of students report use of technology in classrooms. This survey also shows that a “whopping 94 percent of students report that they use technology to do their homework, while less than half of all teachers (46 percent) incorporate technology into homework.” This technology is quite restricted to the use of smartphones, since kids have a heavy usage of mobile phones (see the recent Pew Internet Research 2013 report). I wonder if the 10 years-old boy had the opportunity to use any digital mobile device in his school. I also wonder how his parents would respond to the same question. Certainly, there is an entire new world that is open to researchers who are interested in learning how the next generations will use digital mobile devices in the long term. During my fieldwork, I will observe some of these generation dynamics and I will share some of these thoughts on my research “journey”, here on this blog.